The 5th annual Phil Rogers ’79 Rugby Prize was awarded to Lauren A. Rhode at the annual Senior Recognition Rugby Dinner on May 27, 2011, held at the Colonial Club, while the traditional location, Tiger Inn, was undergoing a major renovation. The Award presentation was made with the help of Rick Barth ’81, a teammate of Phil’s, along with traditional presenters, Henry Maguire ’79 , Marty Rogers ’78, Peter Rogers and Phil’s widow Ieva Rogers ’80. As a Junior, Lauren was selected to be #1 fly half on the all-Ivy tournament team and was elected Captain of the team and then re-elected Captain for the 2011-2012 season. She is from Brookline, MA and is a Woodrow Wilson School major at Princeton, with minors in Chinese Language and Culture and in Near Eastern Studies/Arabic. She focuses on national security studies and conflict prevention, with a particular interest in emerging Sino-US competition and co-operation in the Middle East. After graduation, Lauren will continue with a Master in Public Affairs degree at the Woodrow Wilson School through the Scholars in the Nation’s Service Initiative (SINSI), a “highly competitive scholarship program [which] aims to give exceptional students both the academic training and the practical work experience in federal service needed to succeed in public policy careers.” Since she will remain at Princeton for her Master’s studies, she will be eligible to compete for a 5th year with Princeton Rugby.... a WIN-WIN for all concerned! 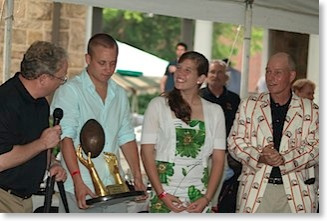 The fourth annual Phil Rogers ’79 Prize was awarded on May 28, 2010 at the Princeton Rugby Dinner at Tiger Inn to two Junior ruggers – Zak Deschaine and Will Harsh. Each of these young men was nominated by their coaches for their individual contributions, as strong leaders and exemplary fellow teammates, of the PURFC Men’s team. The Board of the Foundation felt strongly that each of these candidates was extremely qualified and well-deserving of the Award, so in an unprecedented move, unanimously voted to bestow the Award to two players this year. Zak Deschaine (Second Row) , consistently an “on field” leader, was elected Captain of the team as a Junior and was re-elected Captain for the 2010/2011 season – a “first” 2-year Captain. For Zak, “playing rugby at Princeton has been a great experience and the best decision I’ve made on campus”. Zak is from Frankenmuth, Michigan and is majoring in Economics, with a Certificate in Political Economy. Upon graduation, Zak hopes to be involved in investing and financial markets in some capacity. Will Harsh, also playing Second Row, was President of the Club for the 2009-2010 year, elected for his junior year after having done an outstanding job as Vice President during his sophomore year. In Coach Lopacki’s words, Will “leads the team off the field”. Will is from Atherton, California and is majoring in Politics, Environmental Studies and African Studies and plans to join the Peace Corps upon graduation from Princeton. We were very fortunate to have a number of Phil’s teammates from the Class of 1980 at the Awards dinner, including Steve Maritz, who introduced the Award this year, Dan James, Dan Bennewitz, Todd Cronan and Steve Bawol. Among the “usual suspects” present were Tim O’Neill ’77, Henry Maguire ’79, Phil’s wife Ieva Miesnieks Rogers ’80 and son Oliver (Wake Forest ’12) and Phil’s brothers Marty Rogers’78, accompanied by sculptor Virginia Abbott, and Pete Rogers (Penn State ’85). It was a great evening, weather co-operated beautifully and we (the Foundation) were especially pleased that both of this year’s Prize winners were able to attend the Award Presentation. Marty Rogers, Oliver Rogers, Elaine Bigelow, George Wood. PARMR Fund, along with some of Phil's classmates from 1979, were very pleased to personally present the third annual Phil Rogers '79 Memorial Rugby Prize on Friday evening, May 29, 2009. This year's winner is Elaine Bigelow '10, PURFC Women's team co-captain for 2008-2009. She is from Virginia and is majoring in Ecology and Evolutionary Biology. Also helping to present the trophy this year was Phil's son, Oliver. Ieva Rogers '80, Martin Rogers '78 and Peter Rogers were also on hand to congratulate this year’s winner. Members of the class of 1979 present included, Jeff Shaw, Mark Hallam, Jeff Blount, Will Garwood, Howie Lewis, Jay Moore. Jim Crutcher, Chuck Harper, Henry Maguire and George Wood. On May 30, 2008 PARMR Fund awarded its second Phil Rogers '79 Memorial Rugby Prize to PRFC Junior Joshua Knight ' 09 , A-side flanker. Josh was selected based on his exemplary role as President of the Men's Rugby Club during the '07-08 season and for his leadership role in planning both the 2008 Ireland Tour and the 2nd Annual Rickerson Cup Championship held on April 5, 2008 at the West Windsor Fields in Princeton. Trustees Henry Maguire and Martin Rogers personally presented the Award to Josh Knight at a dinner in Princeton on February 20, 2009. Others in attendance included Coach Rich Lopacki and his wife, Virginia Abbott (sculptor of the Trophy), Betsy Maguire and Peter Rogers. 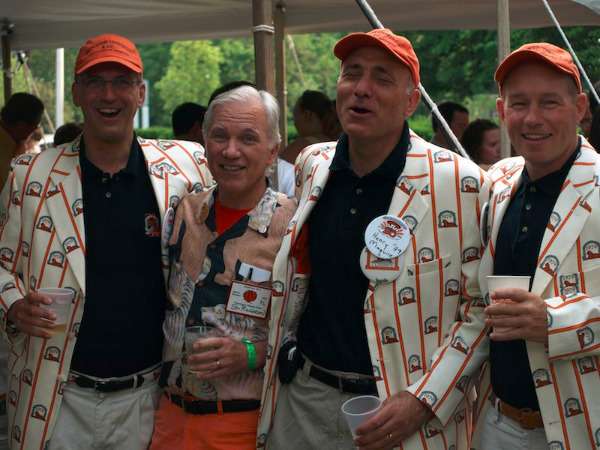 PARMR fund made its inaugural presentation of the Phil Rogers ’79 Memorial Rugby Prize on June 1st 2007 at the annual Princeton University Rugby Football Club Awards dinner. Board members Ieva Rogers, Martin Rogers and Henry Maguire were present . Although the presentation took place during a heavy downpour and thunderstorm, the mood was upbeat. Many of Phil’s team mates, including Julian Heller, George Wood, Bill Ford, Mitch Maloney, Jeff Shaw and D.D. Lewis were there to honor their good friend and join in the festivities. Julian Heller set the stage with his poignant remarks about playing with Phil (to read Julian's words click here). Phil’s teammate and brother Martin and wife Ieva, introduced the trophy with the help of the five teamates, Maguire, Wood, Shaw, Ford and Heller (who were required to lift the darn thing.) It was raised high to a standing ovation. All who were present complimented the design and originality of the trophy. 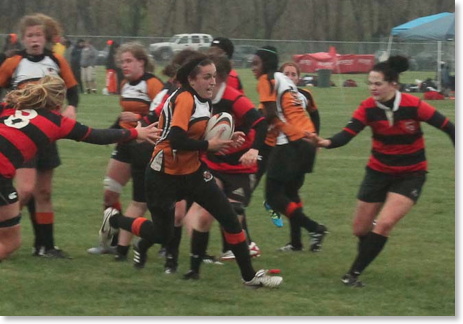 The inaugural winner, Rachel Schupack ’08 (prop forward) was unable to attend since she was flying abroad that day. The prize was received on her behalf by her coaches. We were able to meet our winner for dinner in Princeton, N.J. on Friday, November 9, 2007. Board Members, Ieva Rogers, Henry Maguire, Martin Rogers along with brother Peter were on hand to present Rachel with her framed calliraphy of the poem "If" by Rudyard Kipling and her "boot money" certificate for Rugby Imports an online rugby outfitter.